The part of a sled that connects the two runners and from which the aerodynamic racing shell is suspended. Made of steel, there are two bridges on each sled one in front and one in back. 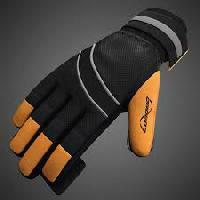 Luge gloves are spiked at the fingertips to assist with the start and paddling motion as the sliders accelerate onto the track. Each hand holds a handle on the side of the sled. Sliders wear helmets that have a clear or tinted visor which extends under the chin to reduce resistance. The German word for runner, usually made of fibreglass or wood. The slider steers by applying pressure with his her foot onto the runners. The aerodynamic shell which serves as the seat for the athlete. Sliders wear specially designed race suits to reduce wind resistance. Sliders must wear special shoes with zipperss, so that the foot straightens out when the zipper is closed. There are also regulations for the insole and heel of the shoe. The sled rides along the track on two steel runners called steels. They are the only part of the sled that touches the ices surface and are attached to the kufens. Luge is the French word for sledge and, like bobsleigh, it was developed as a sport in Switzerland. Its roots go back to the 16th century, but it was not until 300 years later that the first luge tracks were built by Swiss hotel owners to cater for thrill seeking tourists.